Home caring for natural hair in extensions EXTENSIONS how to take down extensions Natural Hair Care Senegalese Twist "take down"
Check out my previous post on how I prepped my hair for the "take down"
First let me review that method. I don't think it is necessary to deep condition your hair before you take down the extensions. I religiously moisturised my hair while I was wearing extensions, so there was no need for the deep conditioning. After taking out the extensions, my hair was not exceptionally soft but it was not dry either. My hair and scalp were very clean especially since I deep conditioned and rinsed the day before. For some reason, conditioners do not work on my matted hair. Only oils do. 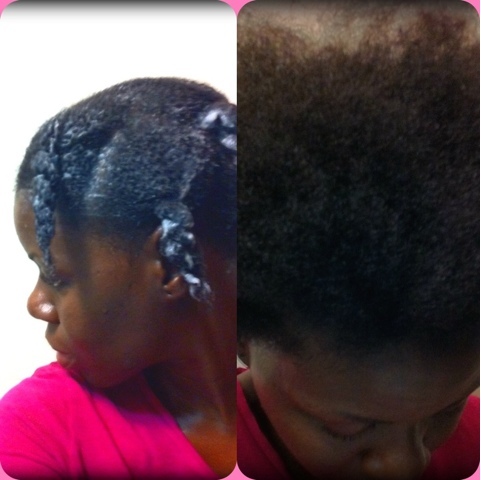 At first, I started used Qhemet Biologics Cocoa Tree Detangling Ghee to remove the shed hair and detangle each section, but it seemed like my hair was coiling up more and detangling was like pulling tooth. So, I opted for the use of oil, Olive oil in this case. Detangling became a breeze once I started using olive oil. By the time I was done, my hair was so weighed down but it was okay because I had to cleanse and detoxify my hair anyway. I still added conditioner and to help me in the process of removing shed hair. As pictured above, I left my hair twisted in 8 sections under a plastic cap and called it a night. Yes, I will do it again. I believe in protective styling. My hair is fine and breaks easily. It fares well when it is left alone (excessive styling breaks my hair). No, I will not go to a stylist again. I think I have gained more than enough confidence to do my own hair. This way, I can redo my edges every two weeks or so. Some people complain of itchy scalp, I did not experience that at all, probably because I washed my hair every two weeks, and oiled my scalp regularly. However, my hair was shrunk up when I took the extensions out. I was sorry to read that you had some breakage but happy to hear that it was minimal. I find the same "easy breaking" issue with my fine hair, too. Ugh! Oil works wonderfully well on me, too. What a great lubricant. What are you noticing about your hair now after two months of rest? From my vantage point, it just looks good, nice and plentiful (thick)! My hair loved being left alone and I think I am going to continue with the protective styling. I haven't worn extensions since I was pregnant. I liked your look, maybe I need to reconsider. As long as you take care of your hair and redo your edges, extensions are fine. I noticed when I take my twists down wet, I experienced the most breakage. I don't know why people recommend using conditioner to take out the knots. I will try the oil method when I actually take these bad boys out. Thanks for the tips!! I had a lot of matting and breakage after taking out twists.. I didn't use oil just conditioner without relief. My questions is now how do I restore my thinned hair?